Welcome. This website is part of a pedagogical experiment in public criminology associated with my class on Police Deviance and Accountability, in the Criminology Department at Kwantlen Polytechnic University. The site is dedicated to exploring topics, events, and themes related to police deviance, corruption, and wrongdoing, as well as questions of accountability, oversight, and reform in policing. 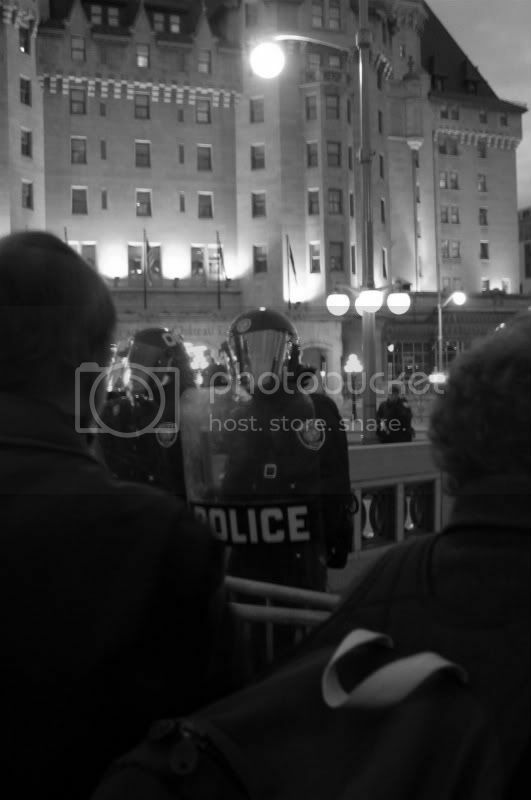 The selection of topics reflects a focus (for the time being) on policing in late modern liberal democracies, with a particular emphasis on the Canadian context. The site was created in 2011. The first group of student bloggers wrote multiple posts on a wide range of individual research topics. The second group of bloggers, enrolled in my Spring 2013 class, will be writing posts that respond to a range of ‘food for thought’ questions. quis custodiet ipsos custodies? Who guards the guards? Who watches the watchers? “A policed society”, notes Allan Silver (1976), “is unique in that central power exercises potentially violent supervision over the population by bureaucratic means widely diffused throughout civil society in small and discretionary operations that are capable of rapid concentration”. We live in such a society. Police agents are distinguished by their capacity to employ means – including legalized violence – that are otherwise prohibited. This creates fundamental and persistent tensions between the powers and practices of the police and the principles of a democratic society. It also underscores the importance of ongoing, robust accountability as a central feature of democratic policing. The routine, everyday practices of police organizations give rise to important questions about the relationship between police powers and citizens’ rights and the scope and effectiveness of accountability mechanisms. These questions are highlighted in cases of police deviance – practices that depart from stated policing norms and involve the abuse of authority and the violation of public trust. This course will provide an introduction to the main forms of police deviance, with a focus on causation and the links between deviant actions and the organization and culture of policing. We will also examine the structures and processes intended to ensure accountability in policing. The course will combine a theoretical approach to police deviance and accountability with case studies that draw on the voices of police personnel, accountability workers, and victims of police corruption. It is my hope that this course will generate ongoing, constructive, critical reflection about what it means to live in a policed society. The theoretical, epistemological, conceptual, methodological, and political commitments we make – explicitly or implicitly – at the outset of a program of research inform our understanding of processes and phenomena and shape the questions we ask and the ways we go about answering them. This is true of any field of inquiry, and a reflexive awareness of these matters is an essential component of research in the social sciences. The study of police deviance and accountability seems particularly sensitive to initial commitments and assumptions, reflecting our understanding of policing as a social and cultural institution. Put differently, our ability to think critically about police deviance is informed – and circumscribed – by acknowledged or taken-for-granted positions on policing, law, order, justice, insecurity, and the state. For example, a certain blend of theoretical and political commitments gives rise to the study of police deviance as a largely individual problem, attributable to choices, moral defects, lapses or errors in judgment, or pathologies associated with particular officers. Metaphors abound, none more popular than the discourse of ‘a few rotten apples’ whose actions, we are assured, do not reflect the standards or culture of the police service. This is a biographical-atomistic approach; biographical in the sense that it locates the cause of deviance in the characteristics and circumstances of individuals, and atomistic because it studiously avoids connecting incidents of deviance to systemic or endemic features of policing as an institution and culture, preferring to treat them as disparate events. Biographical-atomistic explanations tend to be favored by police managers, and they give rise to corresponding approaches to accountability and reform, often involving discipline and training. Alternatively, we can approach the study of police deviance from a social organizations perspective, locating it within the organizational and cultural dynamics of policing as a unique social institution. Individual choices and moral careers are still relevant, but they are understood as being informed by an officer’s location within the organization. This approach is sensitive to trends, context, and the possibility of systemic or endemic sources of police deviance. It seeks out discrepancies between official and informal norms and codes of conduct, and considers the relationships between deviant practices, everyday police work, organizational culture, and the role and function of police in society. From a social organizations perspective, the level of analysis shifts from rotten apples to questions of rotten barrels or orchards. This perspective offers a challenging and critical set of lenses through which to view questions of police deviance and accountability. Our work on this site is informed by a social organizations perspective.